When Ernest Cline sat down to write his science fiction novel “Ready Player One”, he created a dystopian world almost three decades into the future using the technology we are already getting glimpses of now. In a sense- Cline and the characters that grace the 385 pages or his book are prime examples of ourselves in the future. The film, set to release in the United States on March 30 is directed by industry juggernaut Steven Spielberg, famous for movies such as Jurassic Park, Saving Private Ryan, War of the Worlds, Schindler’s List, War Horse and A.I. Artificial Intelligence among many others. The legendary director himself explained that “Virtual reality will be a super drug”, and with virtual reality becoming more predominant with each passing day in society, that statement isn’t too far-fetched. Continuing, he notes that in the film “the fabric of our economy is crumbling. It’s a good time to escape” which is a reflection on our own society today. Virtual reality with devices such as the Oculus Rift, PlayStation VR and the Samsung Gear VR becoming increasingly effective and stable a whole new style of media is coming to light, introducing gamers particularly to virtual worlds full of unlimited potential. This is where we are headed and there appears to be no slowing society down. Spielberg’s film begins in 2045 as Earth itself has been brought to its knees through climate change and a worldwide energy crisis. Poverty, famine, disease, and war are also introduced. This is a true dystopian future – one that we can’t look positively on. 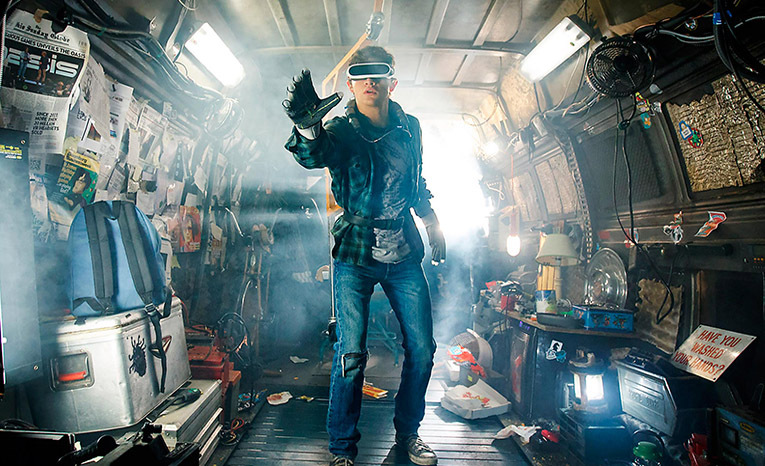 In the story of Ready Player One, protagonist Wade Watts only finds enjoyment in what virtual reality can bring- happiness. This comes in the form of OASIS, a globally networked virtual reality world. Here, Wade can interact with millions of other users on a day-to-day basis. The OASIS was originally an MMORPG (Massively Multiplayer Online Role-Playing Game)- complete with avatars, quests and interactive systems but would develop into a more functioning form of society. Here, Wade attends school as his mother works two full-time jobs to help her family get by. When a quest for the Easter Egg released by game developer James Halliday in OASIS offers the reward of control of the virtual world, Wade is quick to decide he would join in on the hunt with the hope that it could lead to a better life for his family. This description should come off as alarming to you and for some, it won’t. As we progress in time we get closer to a society like that described by Ernest Cline. Some readers may already have come to that understanding or take for granted the life we have today vs. the life we may have in 2045. As Spielberg is quoted as saying, “It (Ready Player One) isn’t too far away from what I think is going to happen someday.” That perfectly describes the idea in the minds of many across the world. Technology and the world around us are phenomenal and we still have so far to go. Just a decade ago in 2008, if you were told in ten years’ time there would be robotic limbs, self-driving cars, and virtual worlds, you’d think you were being lied to. Technology changes quickly and there is a constant fear in that because the realm of technology holds no bounds. As we head into the unknown future- one full of consistent advances in technology, we are looking at a world complete with soon-to-be unavoidable problems. The future may not be as clear-cut as one may expect. What we may believe is a reality now vs. what we may believe reality will be is constantly changing- like the greatest of power struggles. It is up for debate as to whether Ernest Cline was aware of what he created and if it would have such an insightful impact on our future- but he ended up creating a work of art that may be looked back at with fond memories in the future as a book that introduced new-age concepts and spoke of issues that will ultimately plague the population for the foreseeable future. Whether you choose to take Ernest Cline’s work of fiction as something more than that or if you’re adamant this is just a topic that will blow over in the coming months- be prepared for a future of uncertainty as the era of virtual reality takes shape.